The chemistry here is based on a mutual goal approached in different ways. Mars in Pisces pursues the dream, while Moon in Virgo needs detailed proof, but both are striving for a relationship that transcends the ordinary. Mars in Pisces seeks the divine with his beloved. He’s always aware that something more is possible, although he may not be sure what that is, exactly. Nonetheless, Mars in Pisces will do his utmost to manifest what he’s seeking, with intensely romantic gestures, artistic pursuits or his fight for a higher cause. His actions can impress and frustrate the object of his affection–he’ll dazzle her with poetry and sensitivity, but he can also disappoint her with passivity and lack of ambition. Moon in Virgo needs to keep things precise. She feels most comfortable when her finger is firmly pressed on the pulse of her relationship, which means she’ll be constantly monitoring it for flaws. 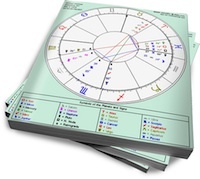 Moon in Virgo’s attention to flaws can drive her partner crazy, but she’ll be the reason the union improves. The upside of her worrying is guaranteed order and continuous upgrades. She won’t allow anything to slide, and she’ll keep the domestic routine (and her partner’s routine) running like clockwork. Mars in Pisces will attempt to impress Virgo with his soulful gestures, but she’ll be drawn to his purity. He can be a lost boy, and she’ll want to fix him up. Pisces may find her fussing and nagging to be a bit much at times, but he’ll be grateful for a partner who handles the mundane details he can’t be bothered with. And, he may have a soothing impact on Moon in Virgo, as he eases some of her worries and helps her forget (temporarily) about getting things just right. Together, they can create a partnership that offers the best of both worlds: pure romance and pure practicality.